Put this on the list of things we want for our next birthday. Remember as a kid, when you would go to the circus and see the guy getting shot of out of the cannon? Yea, compared to this, that’s child’s play – literally. This amazing device, well, kicks you into the air. Yes, this is an air and water-powered human catapult (also known as what we’ve been waiting for our entire adult lives). 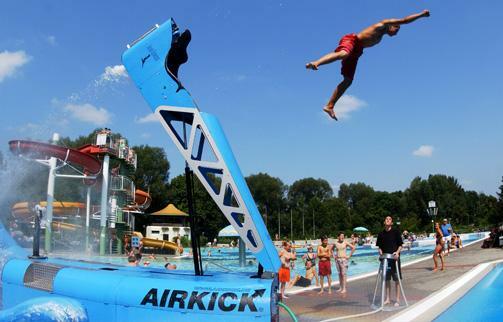 Users sit in a customized seat and at the press of a button, the AirKick uses over 60 liters of water to propel the riders over 25 feet into the air into a foam pit or swimming pool of your choice. You can order it directly from Baller Toys for just a measly $130,000 – although we think that at that price, they should throw in your very own pool for free. According to the website, the AirKick is specifically designed for promotional companies, but there’s no saying that they’d turn us down if a generous reader wanted to donate 130k to NerveRush’s “We Need An AirKick” Charity. Don’t worry, you’re all invited to the first major party we have. Wow! Very exciting! But I don’t think I can make this tricks. I am afraid of heights and this will not work for me.